I was very much disappointed at the fact that, Manchuria and Chilly Chicken etc, are found only the the Chinese restaurants in India. Last weekend we have been to our friend’s place in Munich, and suddenly the two men J and J wanted to have something spicy and so we decided to make Chilly Chicken, after browsing on net for the recipe, and after mix and match from here and there, we came up with this recipe. Mix chicken with all other ingredients, mentioned under ‘For Chicken’. Heat oil in a wide pan, and fry the chicken. Take an other deep pan, add little oil. When hot, add green chillies and chopped ginger and garlic. Then add Onions and Capsicum. Add little salt and fry for 5 mins. Add Soya Sauce, and ajnimotto and Chilli Sauce. Fry for 2 mins more. Add the fried chicken pieces and 2 to 3 tbsp of cornflour mixed in water. Mix well and fry for 2 more mins. Yes Chinese food in India is so different. I doubt Gobi Manchurian is made by the Chinese. It’s easy to do and absolutely free with an account at http://www.intellipodcast.com. We hope you’ll check it out and use our site! We’d love to see your cooking demonstrations all over the web! Looks absolutely authentic indian chinese !! YEs it is definitely indian and not chinese !! wow!looks so colorful and yummy! Cinnamon, That looks fantastic, Even i am a great fan of Indo-Chinese food.. Really yummy. Your recipe looks fantastic, am sure gonna try this one, thnx for sharing! wow wow..there is no stopping you right..that plate looks right off from the restaurant stuff!.. mouthwatering dish!!!! abbba iam going into kitchen….ohh shut there is no chicken???????? Revathi, Ya I always consider it as Indian though everyone consider it as chinese! Apple, even this is a dry item ra, cornflour water I add at last is not much, its just few table spoons. Pearls of East.. Iam glad you liked it. Mona, DO try it lemme know how u liked it. 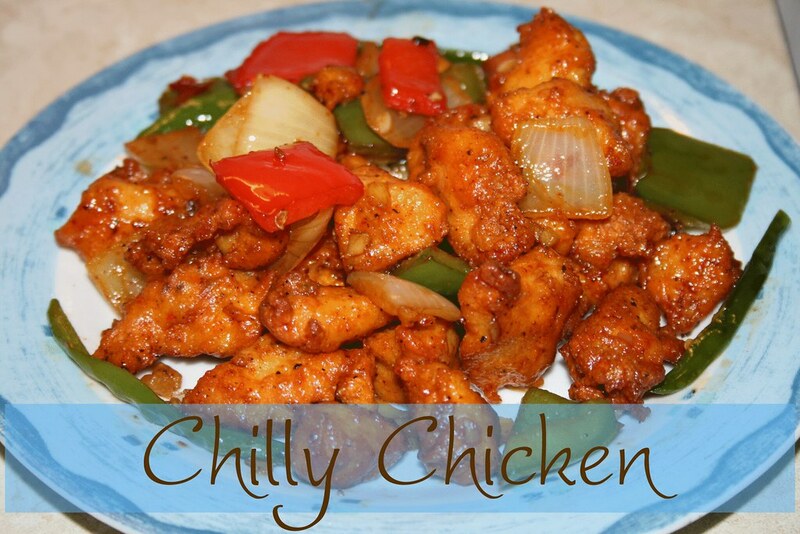 Ummmmm, I’ve never had chilly chicken before. I’m gonna definitely give this a try. CT, being a vegetarian, i make the chilly paneer version of the chicken- the rest of the recipe is the same. love it absolutely. Have just found your blog and it is yest another example of all the great food blogs that are out there! I just don’t have time to read all the blogs I have saved at this stage! I started off blogging myself and have just set up http://www.ifoods.tv which is a place for foodies, bloggers and chefs to hand out and share their recipes, photos and food videos. Would love to see you there sharing some of your great photos! Keep up the great work on the blog, have bookmarked it so will be a regular reader! Sounds like this dish has a bit of tasty zing to, and it looks great! Looks so good and mouthwatering. Very nice. I cam here through Cynthia´s blog. I love spices and chilies, in particular. I am hosting Tried & Tasted event dedicated to cooking from other blogs. This month, we re cooking from Cynthia. Up for the challenge? hey cinnamon…hope you are doing good..